Your extremities are extremely vulnerable to cold temperatures. This is especially the case when you are going hunting. Standing outside in the freezing cold for hours can take a toll on the whole body, not just fingers and toes. 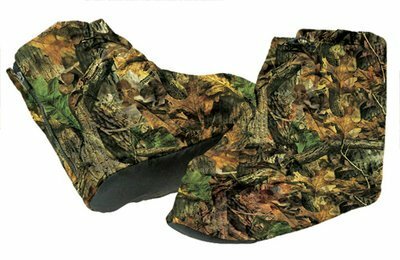 You may be wondering how to keep your feet warm while hunting. Luckily, there are some ways that you can help your feet maintain the warmth that they need. These ways are relatively straightforward and easy to do. While you are outside, untie your boots and wiggle your feet around. move your toes and foot in circular motions to keep the blood flowing. Make sure to not open them too much, letting cold air inside your shoe. 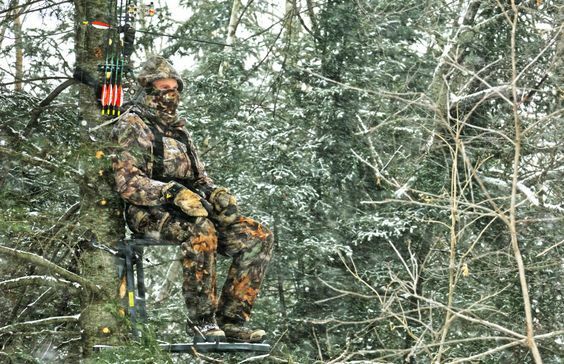 Keeping your feet moving while sitting or standing at the tree ﻿stand helps to combat cold from settling and causing problems with your feet. You can also just stand up and move around to keep the blood moving in your whole body. A simple exercise that you can do is a W﻿ind/Arrow Test (adapted from Yoga). Do it as often as you feel the need to. Step 1: Put your toes together while placing your feet flat on the stand. Step 2: Slowly lift up your heels as far as you can, taking a quick check of the direction of the wind, ensuring your good position. Let them back down. Step 3: Put your heels together and again, lift them up as far as you can. Hold them while checking your arrow on your bow, making sure it correctly nocked on. Then let your feet back down. Drinking hot liquids can keep you warm and toasty on the inside. 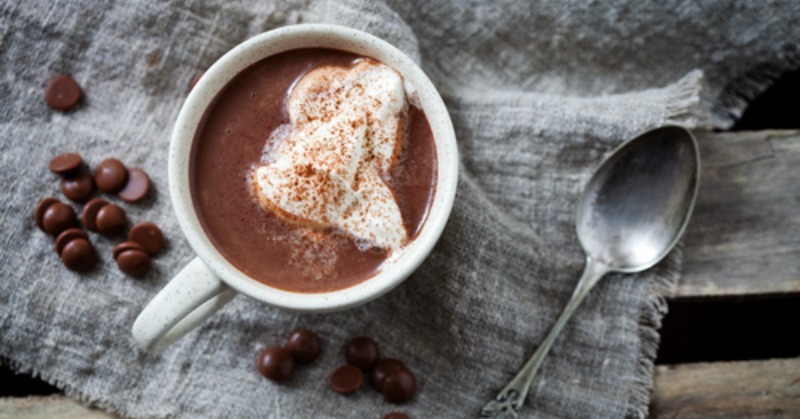 A mug of hot cocoa and a half of a stick of butter can work wonders. Avoiding caffeine is important if you want your body to stay calm while you are hunting. Avoid cotton material. This material not only absorbs your moisture, but from the air around it as well. Thick, comfy, wool socks will be fantastic for keeping your feet warm. Make sure you keep them clean and only wear a pair once. The moisture left over can cause any moisture wicking properties to become ineffective over a short amount of time. 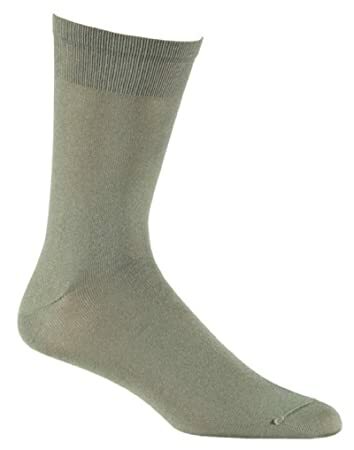 You can wear polypropylene socks underneath your wool socks. 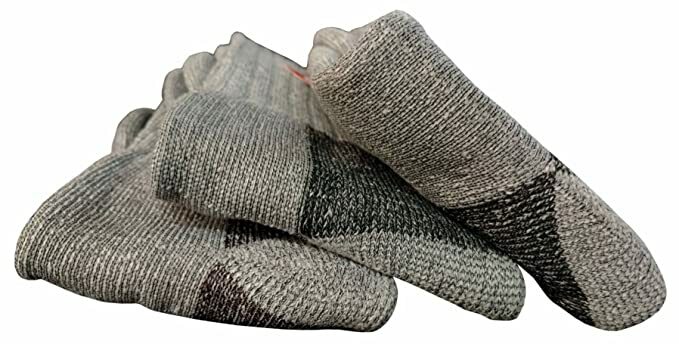 They will wick away the moisture and prevent your feet from sweating and your wool socks from getting very moist at all. Two layers of socks in general is recommended for extra warmth. You can wear heated socks that will keep your feet warm all day long. Nobody likes putting on or wearing wet shoes or socks. Make sure that your shoes are totally dry before you put them back on. The wetness can cause something called immersion foot after some time. And frankly, they are just super uncomfortable while wet. Having another pair of shoes to rotate will not only help them last longer, but will also aide in complete drying. Not wearing them for a day and removing the insoles will ensure that they are completely dry and ready to be worn. 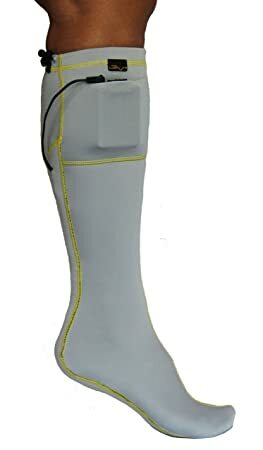 Insulated boots are super helpful and can be amazing at keeping your feet warm. Some can be designed to keep your feet warm and dry, even in sub-freezing temperatures. There are even specialized blankets just for boots. Take advantage of these and never let your feet get cold again. 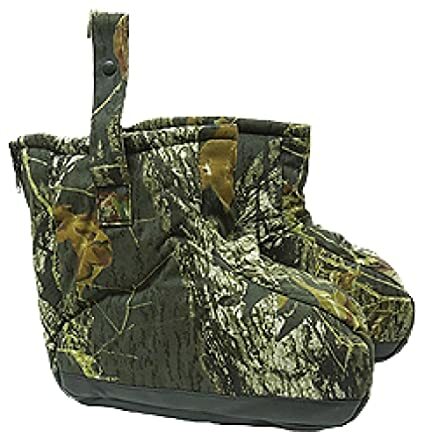 You can use heated wraps to cover your boots once you get to your hunting spot. They are hard to walk in so do not waste your time trying to walk to the stand with them on. Putting them on when you get there will be an easier thing to do. These can be used with any pair of boots that you wear. Boot covers have pockets where you can place hand warmers to keep them extra warm. This means that you do not need to use batteries. Something you can also use as a wrap is a bread ﻿wrapper or oven bag. 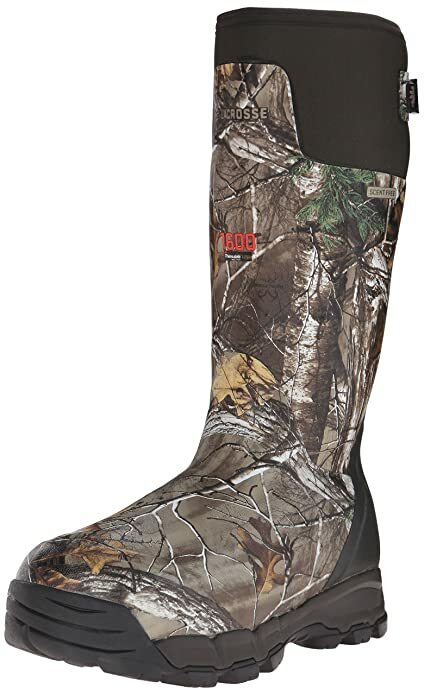 Put them over your feet and calves during your walk to the stand, and your feet will be nice and toasty. Foot warming packets are made for this exact situation. You can place them in your shoes, and they will keep them warm for a good amount of time. These packets come in many sizes and types, for all kinds of different parts on your body. They can be a great help keeping you warm overall. They can sometimes either not last long or make your feet sweat. Make sure you are wearing moisture wicking material to ensure your feet will not get too sweaty and cause issues like trench foot. 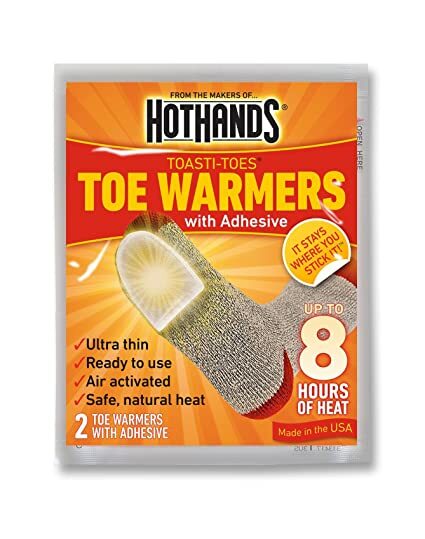 You can also use hand warmers in the place of foot warmers. Walk slowly to the stand in order to prevent yourself from stimulating your sweat glands unnecessarily. Putting cotton balls in between your toes can help them stay warm. Be cautious with cotton, however, for it is not great in cold weather. The added cotton between your toes with your thick, warm socks should be enough to keep your feet warm for a while. Do not wear steel toed shoes. The steel will get cold and conduct the temperature into your toes. It will make the cotton between your toes pretty useless. Make sure that you are using enough to fully cover your toes. Covering your feet with a heated blanket while you sit or stand can be great. Not only will the heat keep your feet warm, but the heat will also rise throughout the rest of your body. You can also use a blanket to put over the shooting rail to block the breeze. Ensure that your blankets are washed with scent-free detergent. Also, leave it outside the night before. This helps to reduce the scent and bring attention to you while hunting. 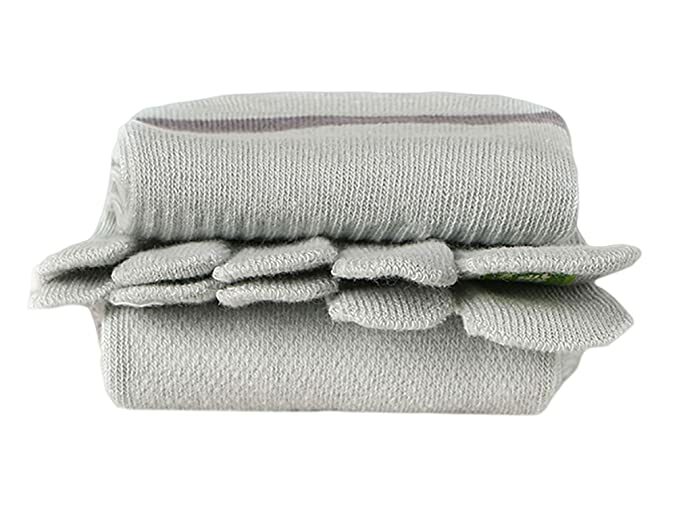 Placing a chemical warmer on your feet and then covering up with a blanket is another way to utilize them. Staying warm while hunting in the colder months is important. Many things can go wrong and cause your body to retaliate. Frostbite and hypothermia are just a few of the issues that you can come across. While you are hunting, make sure your toes and feet are as warm as can be before even leaving the building. You want to avoid feeling cold as well as trench or immersion foot. Feet are super important to everything you do, and losing one because of the cold would not be ideal. Let me know if this list helped you and what you think in the comments! 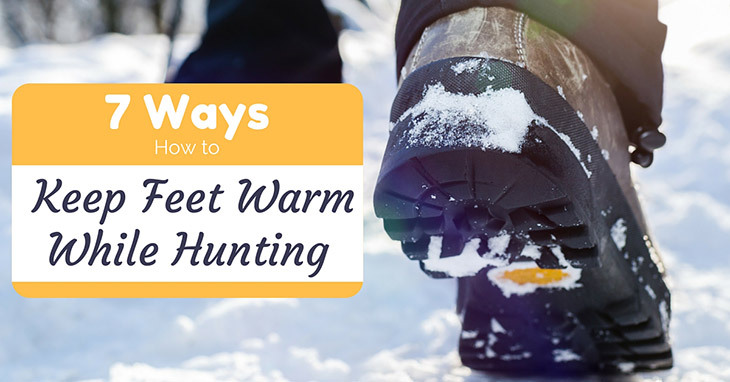 Share with your hunting friends to help them keep their feet warm as well. Great article, but I’m surprised you didn’t cover heated socks or insoles. Would love to hear your experiences with those. I will update later. Thanks for reading my article.